PENDRAGON (NZ) (Bay 2002-Stud 2007). 2 wins at 1800m, 2000m, STC Gloaming S., Gr.3. Sire of 85 rnrs, 42 wnrs, inc. SW Miss Gunpowder (MRC Thousand Guineas Prelude, Gr.2), SP The Peak, Abba, Dragon Flyer and of Heartlings, Gid Up Strop, Subsolar, Colour of Money, Dragon Wheel - Glorious Sunday (H.K. ), Killarney Kid, Kurrajong Dragon, Tale of the Dragon, Blazing Dragon, Dark Brown Sugar, Dragonzone, Megathink, Military Manor, That's Karma, etc. Laus Deo (g. by God's Own). 3 wins at 1200m, 1300m to 2016 in Malaysia. Solar Sky (g. by Pendragon). Winner at 1600m in 2015-16 in Aust. Silician Dragon (g. by Pendragon). Placed at 3 in Singapore. Rocky Ride. 2 wins at 1400m to 2015-16, WRC New World Railway H.
Prince Omaha. Winner at 1200m in Malaysia. PLAUDITS (Danasinga). 4 wins from 1000m to 3000m, A$76,450, QTC Eagle Farm S., L, MVRC Jayco Bay Classic H., 3d MRC Monomeith H.
SACRED STAR (Flying Spur). Champion Sprinter in NZ in 2014-15. 8 wins-1 at 2-from 1200m to 1900m, NZ$397,000, A$242,300, to 2014-15, Waikato Sprint, Gr.1, WRC Telegraph H., Gr.1, BRC QTC Cup, Gr.2, ATC Startrack H., Waikato RC Pathways Immig Specialist H., BOP RC Stewart Browne Group H., Counties RC Vernon & Vazey Truck Parts Ltd H., 2d Waikato Sprint, Gr.1, 3d WRC Thorndon Mile, Gr.1, 4th ARC Railway S., Gr.1, Hawke's Bay Windsor Park P., Gr.1. DIADEME (Savabeel). 7 wins at 1400m, 1600m, NZ$390,235, A$32,000, to 2014-15, Te Aroha JC New Zealand Thoroughbred Breeders' S., Gr.1, Waikato RC Cal Isuzu S., Gr.2, ARC Westbury Classic, Gr.3-twice, BOP RC Pace Project Management H., 2d Waikato RC Cal Isuzu S., Gr.2, Manawatu Challenge S., Gr.3, 3d Waikato Sprint, Gr.1, Te Aroha JC New Zealand Thoroughbred Breeders' S., Gr.1, ARC Rich Hill Mile, Gr.2, BRC Glenlogan Park S., Gr.3, 4th Waikato Sprint, Gr.1, ARC Rich Hill Mile, Gr.2-twice, BRC Strawberry Road H., L, Waikato RC Sprint H., L.
Deadly Shadow (Savabeel). Placed at 3 in 2015-16, 2d VRC Poseidon S., L, 3d MRC Cable Beach Club Resort P.
Roop All (Pins). Placed at 3, 2d VRC Lexus Hybrid P., L, MRC Sunrise Cup. STRIKE THE STARS (Savabeel). 2 wins at 1400m, 1800m, A$556,550, ATC Gloaming S., Gr.3, 2d VRC Australian Guineas, Gr.1, 3d NSW Tatt's RC Chelmsford S., Gr.2, VRC Tab.com.au S., Gr.3. DELTA GIRL (General Nediym). Winner at 2, NZ$3,200, A$78,000, AJC Widden S., L, 3d STC Magic Night S., Gr.2. MARSEILLE ROULETTE (Zizou). 3 wins-1 at 2-at 1200m, A$217,155, S$72,798 in Aust. and Singapore, ATC Inglis 2YO Classic, L, 3d ATC Run to the Rose H., Gr.3. SPORTSMAN (Supremo). 10 wins-2 at 2-to 1500m, A$782,100, AJC Expressway S., Gr.2, STC Shannon H., Gr.2, Peter Pan S., Gr.2, NSW Tatt's RC Tramway H., Gr.3, 2d Queensland Guineas, Gr.2, STC Phar Lap S., Gr.2, 3d AJC Warwick S., Gr.2, STC Gloaming S., Gr.2. PRISONER OF LOVE (Canny Lad). 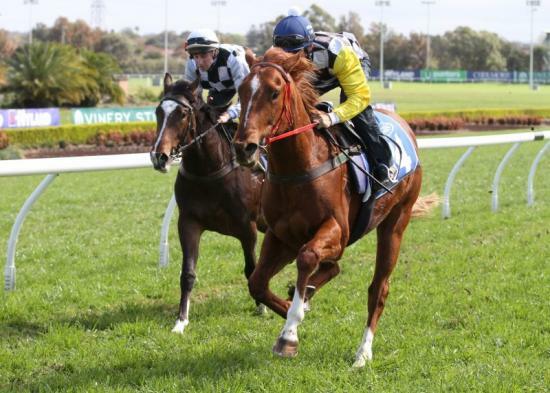 3 wins-1 at 2-to 1500m, A$221,470, STC Tea Rose S., Gr.2, NSW Tatt's RC Furious S., Gr.3, AJC Ad Alta 2YO H., 2d AJC Wiggle H., L, STC Triscay S., L, 3d STC De Bortoli Wines 2YO H. Producer. HOYSTAR (Danzero). 6 wins at 1100m, 1200m, A$376,875, AJC Frederick Clissold S., Gr.3, STC Star Kingdom S., Gr.3, 1200m-in track record time, Maurice McCarten S., L, 2d AJC Challenge S., Gr.2. KING OF PRUSSIA (Anabaa). Winner at 2, A$91,250, VRC Peters Drumstick S., L, 2d VATC Guineas Prelude, Gr.3. Sire. VANBRUGH (Encosta de Lago). 4 wins-1 at 2-from 1200m to 2000m, A$525,375, to 2015-16, ATC Spring Champion S., Gr.1, Gloaming S., Gr.3, All Too Hard at Vinery H., Employee Long Service Celebration 2YO P., 2d ATC McGrath Estate Agents 2YO H., TAB Rewards H.